No chess this week - SUNFLOWERS instead. This is a project that I have been working on since May, 2009. I am going for a field of sunflowers and I have had every professional and amateur artist I meet contribute a sunflower to the field. I got away from it for a while, but it needs to be finished - I'll tell you why when it is actually completed. Tim drew the first one (I'll get you his last name - He's always just been "Tim"), the next is local artist Jennifer Aikman-Smith, then we have ME, then our good friend and site designer Eric Dyck, and finally, professional comic artist Nick Bradshaw. Thanks for the help on this personally special project. Merry Christmas and Happy Holidays. The computer is back and do are new strips. Starting next week I want to commit to 52 comics posted in 2010! Lotsa learnin' and lotsa jokes. I'm still having trouble with my home computer, but I found this comic I did months ago when I was toying around with computer lettering. If you are a regular reader (hello to you) you will notice how the look of the king and queen is different now (better looking, I hope). Hey! Great Looking Site...But Haven't We Already Seen This One? I am going through the perfect storm of not-getting-up-new-comic-ness: report cards due + main computer down with a virus, which means the scanner is down + did I mention that report cards are due? Anyway, the drought should soon be over. I have an oficial Grand Opening coming up with five days of themed gag strips (I can't wait - I'm already giggling) and then on to new chess learnin'. Thanks to Eric Dyck for the new design. It looks great! Chess In the Movies - It's Not Logical! See you next time for more chess learning.. I had to look up how to spell jealous...It still doesn't look right. This one was late because I was late and because the power kept going on and off last night (windstorm). This one sure is wordy, but it was fun to do - I like how the Rook's word baloon keeps getting smaller and smaller. 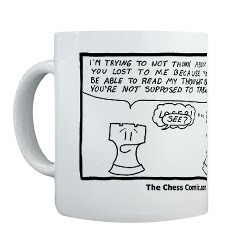 We're teaching you chess...One comic at a time. Wow, that title is dated already. I think it's time to get some replacement pieces off another board. It really isn't going to end well. Enjoy the strip. More Rook goodness next week. How in the world am I supposed to draw a rook shrugging? On to the ROOKS. I had just gotten to this point almost a year ago when I decided to restart the whole thing. Few strips survived the reboot, but the next 4-5 rook strips were drawn last October/November and 2-3 of them were published. While I hope I have improved from a year ago, after a little tweeking I think the old rook strips will hold their own. I actually forgot this very important piece if information (it should have been posted way back in May!). I have rectified that problem and you can see the posted comic full size at its new home HERE. This one should have been strip #30, but I missed it. Oops. To anyone that noticed (and you deserve a "No Prize" if you did) I know that the belt is mostly a Flight Belt, but I liked the look and I think it still works :) . It's a bit late, but here it is. A few things here and there and then on to the next piece! Last week's delayed strip turned into no strip at all. Sorry for that. As soon as the King and Pawn Game strips are done I will be going back and filling in any gaps in King info I forgot to fill. Oops. I'm not sure how many of you younger readers will get the references in panels 3 and 4. 4 is from Top Gun and 3 is from this. 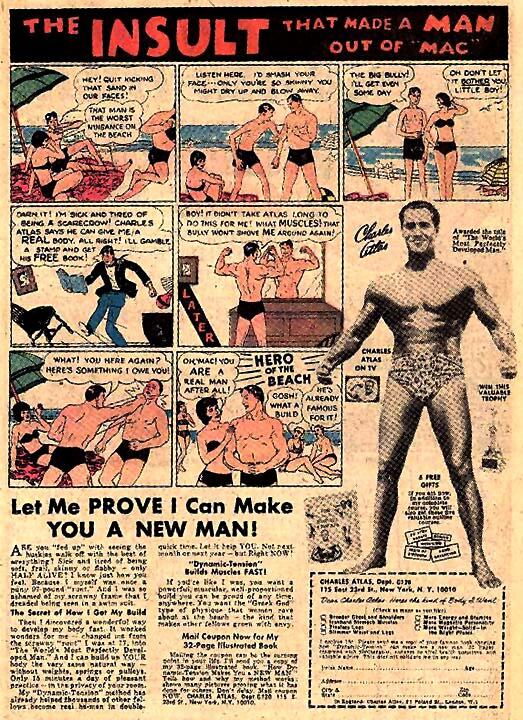 It is an iconic advertisement that could be found in comics for decades (it or ones like it). Sorry the comic is so late. 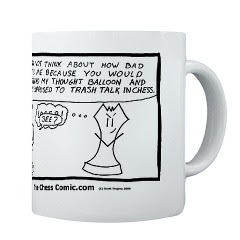 New strip will be along tomorrow, but for now - MUGS! 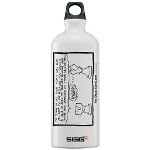 I just opened up a Cafe Press shop and I am currently selling the "Trash Talking" strip on two mug sizes and a metal water bottle. This design is a temporary one and I will be doing some more very soon. If there is any interest I will try out some t-shirts as well (at least one for me). You can see the original strip HERE. I kept the pieces white for the mug instead of the black I used for the strip. I wasn't sure how the black would look. When I create a design just for merchandise I will make sure the black chessmen have features that will stand out. Since it is my first try at this I kept the mark-up real low. The king is like me - We can't pull off those little jokes. Some people can say the same thing and the whole room is roaring...but I'm the guy that falls flat on his face. Poor us. A new arc of comic starts here. 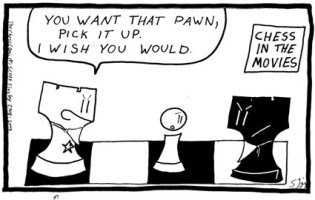 Originally I had introduced the Rook after the pawns, but then I realized that I wanted to do the King and Pawn game, so when I scrapped my previous 15 or so comics and re-did everything last Novemeber I decided I would switch the king in for the rook. Ha! I just noticed that I gave the King the Queen's crown. Oh well. It looks pretty good. Maybe I should use it instead. My wife didn't get is, so I'm not sure if it is stupid/funny or just plain stupid. Free Comic Book Day is next Saturday, May 2nd. It's like my birthday Part 2...even better. Free comics! What could be better? Click HERE to find out more. It can be a lot of fun for the whole family - I highly recommend it. I am going to have a mini-comic of my first 20 or so comic strips to give away at Gamezilla, my local comic shop, on FCBD. I'm a little excited about that. It is about time. Lots of King stuff to come. If you are so inclined, be sure to leave a comment bellow. Trying out a new colouring look. I won't do the white/black background scheme often, but I think I like it. Have a nice Easter Break. I giggle every time I look at this one. Perhaps it is a bit dated, but I don't care. I had it ready and since I just finished Report Cards and I'm in the middle of Parent Teacher interviews I'll finish up the "Pawns Down the Middle" stuff next week. New comic! I can't wait to put up next week's strip. It makes me giggle every time I think about it. I think that this is actually the oldest comic that I have up now. Even though I have never posted it, this is the last comic I made before taking everything down and starting over. I just found THIS. 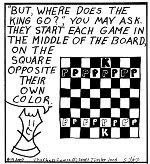 From what I can tell, this book Learn How to Play Chess by Reading the Comic Book came out after my comic strip did. Not that it matters. Isn't it funny how two people created such a similar sounding product at the same time. And we're both from Canada! Life is funny that way. i was hoping to find out some more information, but I can't even find a contact for the creator. From the cover image it is clear that our comics are completely different in visual style and tone, but I would really like to get a look. So stop reading and go practice already. It's about time this went up. Sickness spread through the house like wildfire this past week and this is the first chance I have had to post #17. I'm experimenting with using the computer for lettering. My font choices are limited and here is what I have so far. Any suggestions? This one needs some explaining. I have created superhero identities for my two kids – Power Mariah and Jack Hammer. I am teaching my 4yr old daughter how to play chess and she told me that she wanted me to make Jack Hammer and Power Mariah into chess pieces. So here we are. What’s with the dinosaur and killer robot pawns? Former enemies of JH and PM. See you in two days for comic #17.